If you know me, you know I love a theme. Buy Numbers - Wood numbers can be tricky to find in stores, so I ordered them online from JoAnne Fabrics. Brainstorm - While I was waiting for the numbers to arrive, I brainstormed monthly themes. I started with a list of what number would be associated with what month. Baby Girl was born in July, so the 1 would be August and then 2, September, etc. Then, I thought about what would be happening that month around Lennon’s date. For instance, her monthly update would be a few days before Halloween, so October was a no-brainer! I LOVED February because the date fell near the Oscars and the number 7 made the perfect red carpet! For some months, I went with just a general seasonal number. The 4 was during fall, so I used leaves. Complete the Project Early - Knowing that life would get a bit more hectic once I went back to work, I decided to make all numbers at once when I had a newborn that liked to nap! Attire - After the numbers were complete, my project wasn’t done! I’d need to theme up Lennon’s outfit. I typically planned about a month in advance in case I needed to order something online - allowing enough time for the outfit to arrive. Take Monthly Pictures - Each month I photographed Lennon on a white blanket. I found it was best to take her picture after she ate and was alert! 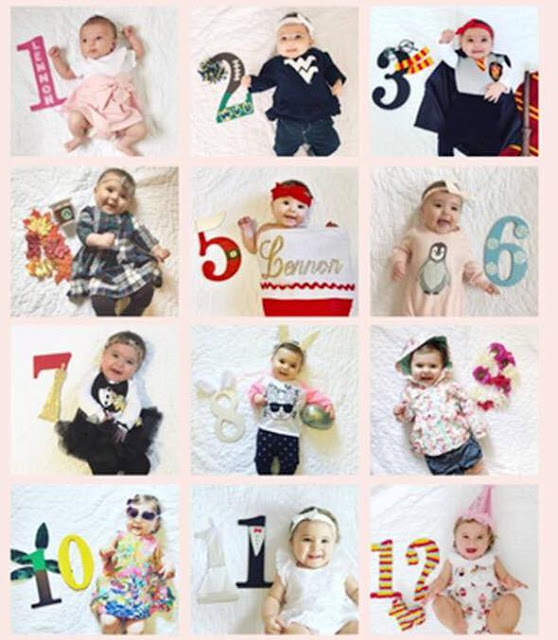 I displayed the photos at Lennon's first birthday party and then used them on a thank you note (it's a little blurry because it's a screen shot)!